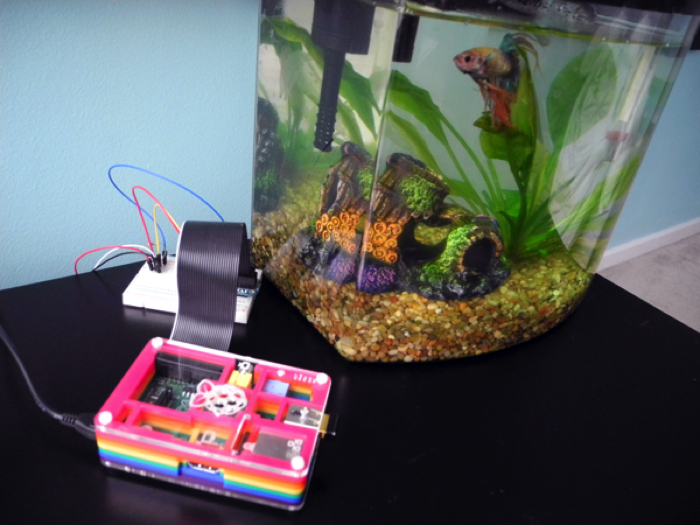 How to get texts from your fish using Raspberry Pi! #piday #raspberrypi @Raspberry_Pi « Adafruit Industries – Makers, hackers, artists, designers and engineers! This is a follow up to Lauren’s first project which we blogged about here. Via ReadWrite. The Internet of Things makes it easy for us to monitor our homes. Today I’m taking that concept one step further—getting our homes to report back to us. In early March, I wrote about using Raspberry Pi to quantify my fish tank—in short, I taught the $35 single-board computer to monitor the temperature of my home aquarium no matter where I was in the apartment. Of course, the limitations of this project were clear: I could only keep tabs on the tank while on my home network. What if I want my fish to text me when it needs my assistance? The problem, until now, was that getting the Raspberry Pi to initiate communication was hard. I experimented with a Node.js receiving application, and contemplated buying a server from which to run it (since my Bluehost server space doesn’t support a Node installation). The other way to get the Raspberry Pi to talk to me was to teach it to text my phone. There are also many ways to achieve SMS support in Python, Pi’s primary language, but they all either involve money or writing programs that are way over my head. However, I wouldn’t be writing this article if I didn’t eventually find a way to do it. The answer turned out to be Twilio, a developer-friendly set of tools for creating SMS, voice, and VoIP applications. Twilio charges pennies for calls and text messages to any phone, but it’s free to develop programs that text your own phone. That second part might not sound useful at first, but it’s exactly what I needed to complete my fish tank project. I met with Matthew Makai, Twilio’s DC-based developer evangelist, and he helped me solve the problem. It only took nine lines of code. If you’ve already finished the first tutorial, here’s all you need to do.